The probability of Fed’s rate hike puts gold under pressure. Gold is also under the influence of North Korea and the US issue along with Trump’s tax reform program. The support rests at 1293.99 with resistance at 1300.99 which both lines are above the weekly pivot point at 1274.23. The EMA of 10 is moving with bullish bias along the ascendant channel and it is below the EMA of 200 and above the EMA of 100. The RSI is falling towards 50 level, the Stochastic is showing upward momentum and the MACD indicator is in positive territory. The ADX is showing buy signals. The price is above the Ichimoku Cloud and below the Chinkou Span. The Tenkan-sen and the Kijun-sen are both showing an upward trend. 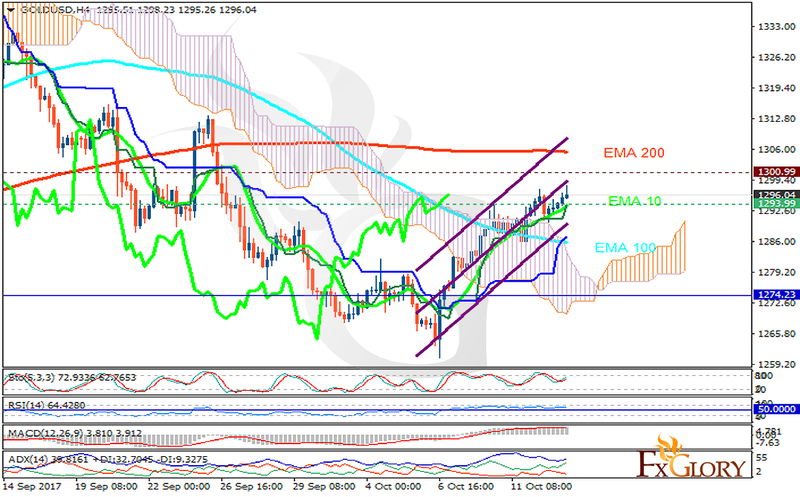 Gold will continue its bullish trend targeting 1310.